Not really seeing much theatre lately…missed a couple at the end of last week, on account of interviews are WAY harder than reviews. And not much new in town this week, aside from the fun Easter Ontario Drama League festival at the OLT (which I may hit up in a day or so), plus COMMUNION at the NAC which I’ll be catching tomorrow. 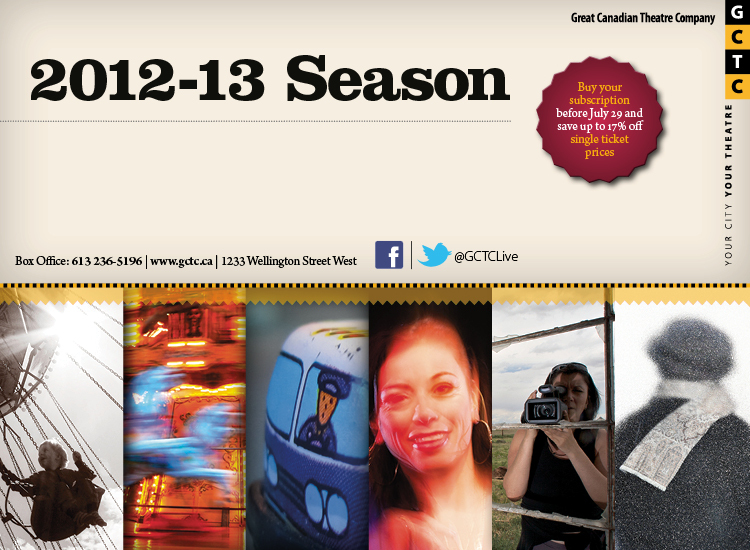 So today was all about the Great Canadian Theatre Company, who were having a big to-do to announce the lineup for their upcoming season starting this September, even as we approach the final show of THIS season (the upcoming CIRCLE MIRROR TRANSFORMATION in May). 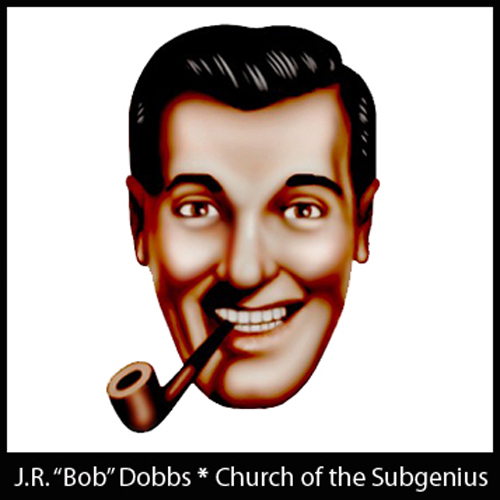 I was down a little early, so poked a bit in good old St.Vincent, where I found a dirt-cheap copy of the BOOK OF THE SUBGENIUS! Good omen, no? Bob already approves of the upcoming season. Praise Bob! THE SECRET MASK by Rick Chafe. Described as a semi-autobigraphical story about George, a man abandoned by his Father at age 2 who meets up with said Dad 40 years later, after he’s had a stroke and hardly remembers who he is. Like several other shows at the launch, this one had a scene acted out in a reading from local supertalents Pierre Brault, Sarah McVie, Kate Hurman and Paul Rainville, and it looked pretty funny. A good start. FLY ME TO THE MOON by Marie Jones. A new play by an Irish playwright, I suppose it was inevitable that Ottawa’s leading Irishman John P.Kelly would be tagged to direct this dark farce about a pair of caregivers whose elderly charge dies on them. Marie Jones herself chatted with us via Skype at the launch, telling how she got the start to the play by heading away for the weekend with a couple of actress friends and an armful of wine. Which sounds like a perfectly goddamn fine way to write a play to me. THE NUMBER 14 by Axis Theatre, and the Number 14 Creative Collective. This show played at the old Gladstone GCTC 12 years ago, and from the buzz I heard in the room when it’s name was mentioned, this return engagement will be highly anticipated indeed. 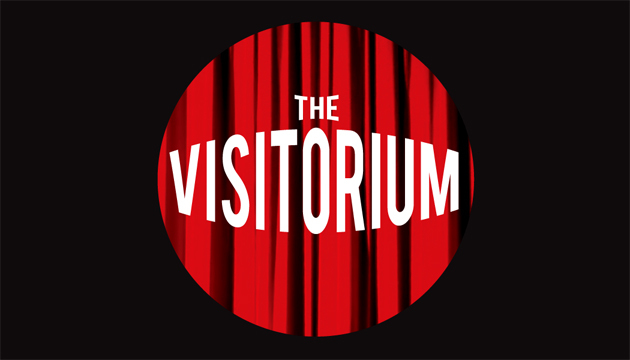 Set entirely on a Vancouver bus route known for its, shall we say, colourful episodes (not unlike our own route 14, and I can atest to THAT one personally), the show is billed as a mix of physical comedy, mask, puppetry, and maybe the kitchen sink too. I already can’t wait for this one. BLUE BOX by Carmen Aguirre. Hey, Wayne was right, it IS a mainstage show! After a successful run at UNDERCURRENTS this year, and just a day after being announced as part of this year’s MAGNETIC NORTH lineup in Calgary, Carmen’s powerful and charismatic one-woman monologue returns for a run in the big room, which will leave even more room for dancing. THE EDWARD CURTIS PROJECT by Marie Clements. This one we already knew about, as it was announced at the NAC season Launch last month (like VIMY, this is a co-production between the 2 theatres). Part theatre work and part photo gallery, I’m even more intrigued about this show NOW than I was when I first heard about it. LIKE WOLVES by Rosa LaBorde, one of GCTC’s writers-in0residence last year. A world premiere show about an elderly couple whose anniversary celebrations go from bad to worse, this is a seriously promising looking dark comedy that should make for a strong finish to the season.